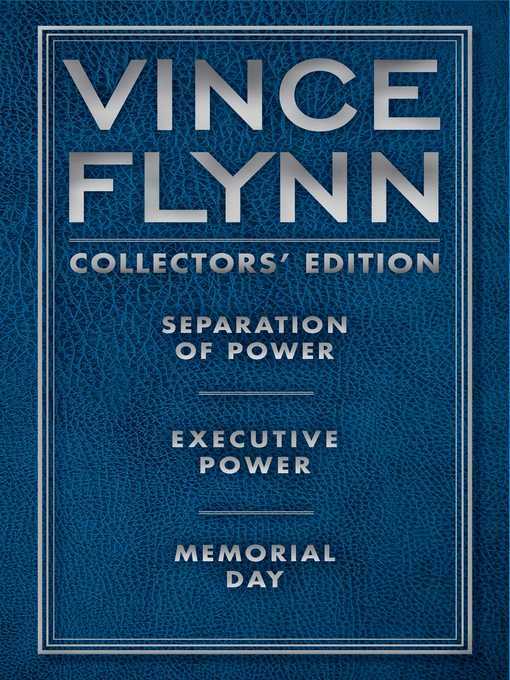 In this special collectors edition, relive the action in Vince Flynn's #1 New York Tmes bestselling political thrillers: Separation of Power, Executive Power, and Memorial Day. Newly appointed CIA director Dr. Irene Kennedy is the target of an inside plot to destroy her and prematurely end the American President's term. To make matters worse, Saddam Hussein is close to entering the nuclear arms race — something Israel has vowed to stop. With the haunting specter of World War III looming, the President calls on his secret weapon: top counterterrorism operative Mitch Rapp. But with only two weeks to take out the nukes, Rapp is up against a ticking clock — and impossible odds. CIA intelligence has pointed to a major terrorist attack on the United States, just as the nation's capital prepares for a grand Memorial Day tribute to the veterans of World War II. Racing to Afghanistan, Mitch Rapp leads a commando raid on an al Qaeda stronghold in a remote border village — and defuses plans for a nuclear strike on Washington. The crisis averted, the special ops work is done. But Rapp knows, in the face of a new kind of enemy, nothing is as it seems — and it's up to him alone to avert a disaster of unimaginable proportions.